Last week I showed you Mitch’s Minecraft “diamond” helmet, so here’s the chest plate to go with it! We got it finished just in time to wear to Grant’s Farm Halloween Nights this weekend and it was a great success. Plenty of kids skipped up to Mitch and said they loved his costume! 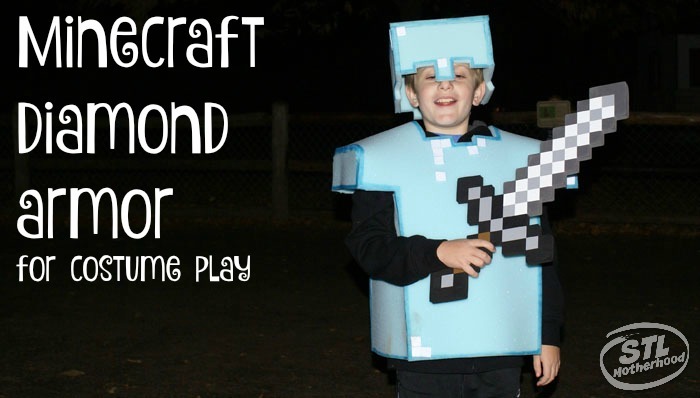 The armor is made from soft and flexible cushion foam, so unlike other DIY Minecraft suits made from boxes, this is a costume you can really move around in and sit down in! Cushion foam is available fabric stores and some craft departments. We got ours from Hancock Fabric, which is currently running a sale. I picked up a package with 24 x 72 inches of foam, enough to make the helmet AND some chest plate. The foam is normally $18, we picked ours up for $10.79. Are you in St. Louis?? We went to the Hancock in Kirkwood. I’ve also seen small rolls of white foam in the craft department of Walmart, and I’m sure any decent fabric store will carry this foam. One package of foam should be enough to make a helmet and the chest plate, but honestly, I used two packages. But that’s because I’m a messy crafter and re-cut the helmet three times to make it perfect for you guys and Pinterest. Plus, we now have enough leftover to make “boots” or some sort of leg covering. However, if you use my helmet template here, you’ll only have to make it once–be sure to watch my video to see the dorky prototypes! Note: Mitch is a skinny 8 year old boy who wears a Youth Medium shirt. Your child may need more or less foam. Please Note: You can always cut the foam SMALLER. It’s pretty hard to make it bigger! When in doubt, cut bigger. You can always trim it down. First, here’s a sketch of Mitch’s chest plate. 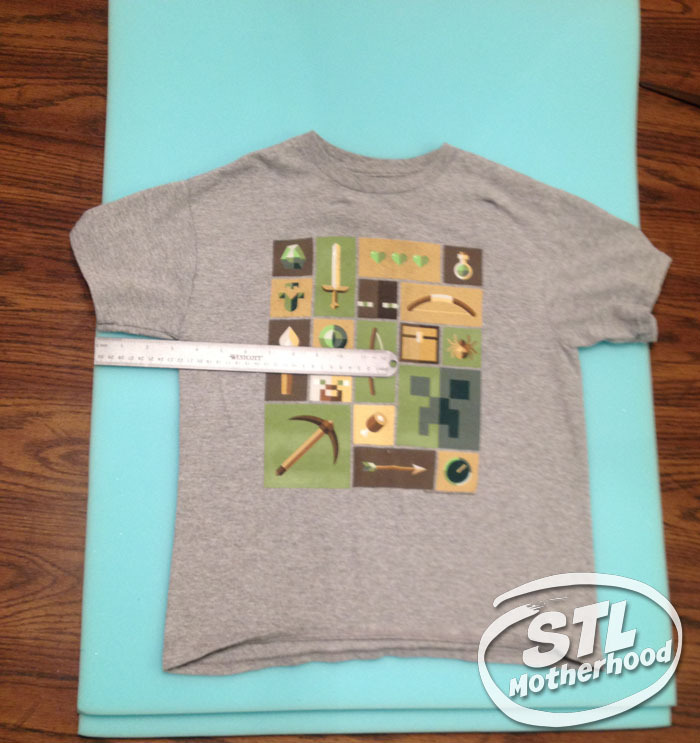 He wears a Youth Size Medium, and it that fits your kid…then just use our measurements and get going! 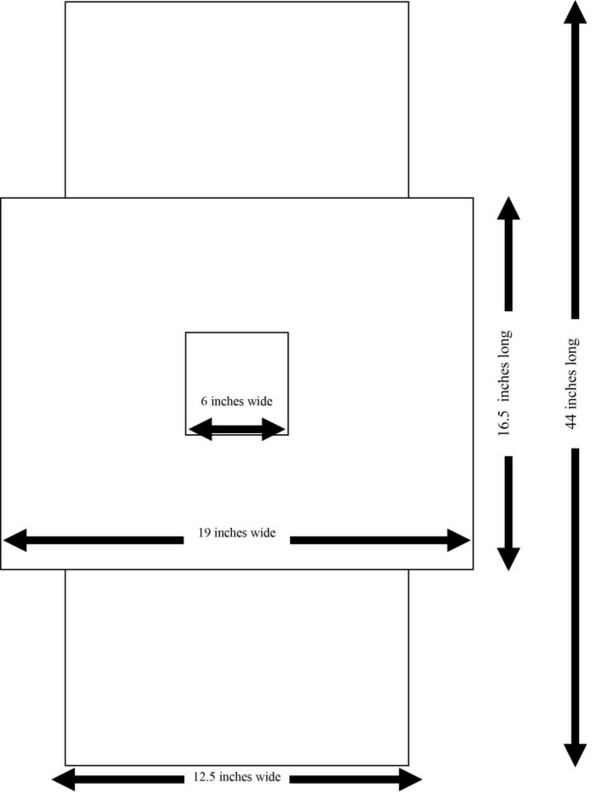 Now, for the details…this is how I got those measurements. This is handy if your kid is bigger or way smaller and you need to start from scratch. 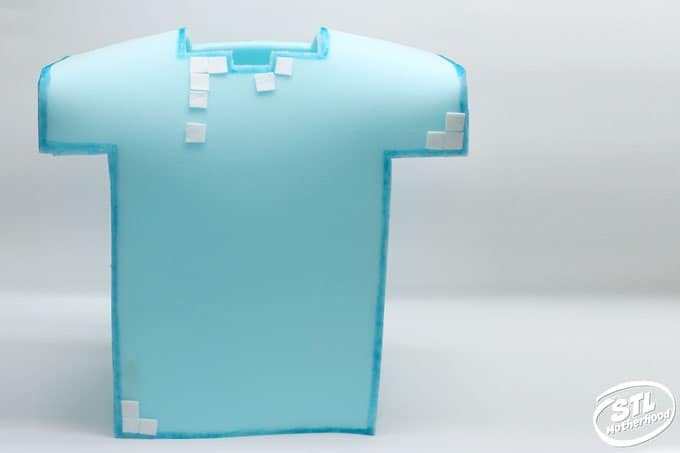 The chest plate is basically a 3D “T” shape, so start by grabbing one of your child’s t-shirts that fits well. Place it on the foam, with the hem at the bottom of the foam. Use the Sharpie to mark the neck opening and the armpits. A couple dots will do it. Take the shirt off the foam and lay the whole piece out flat. Use a ruler (or tape measure) and find the center of the foam. Draw a SIX INCH Square for the neck opening. You can use this template: chest plate. Now fold the foam in half, with the neck opening centered on the fold. Place the foam on a safe cutting surface and trim off the extra foam at the bottom. Open the foam and cut out neck hole. Grab your kid and place the foam on your child. Now decide how wide the armor needs to be–it won’t be as wide as the shirt! Remember, you’re making a box! You just need a front and back side of the armor right now. Mark the foam where you will trim it down to fit your kid’s torso and sleeves. For example, Mitch’s armor is 12 3/4 inches wide at his chest, plus 3 1/4 for each sleeve. So, his armor is about 19 inches wide at the shoulder. While your child is wearing the foam, measure his or her “thickness” for the side panel. 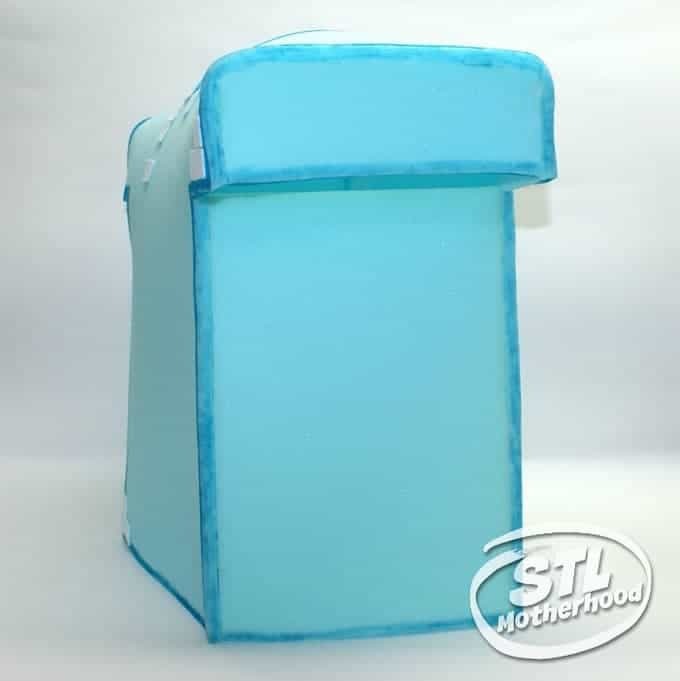 Remember, you’re making a BOX so measure the child’s thickest point so the foam will not curve around his or her shape. Remember to leave a little wiggle room for a jacket underneath the armor if you plan to wear this Trick or Treating in chilly weather. Mitch (again, a size youth medium) has a side panel of 9 inches. Cut the side panels from the extra foam. The side for the sleeve was more interesting to calculate. It will be the same width as the torso side panel. 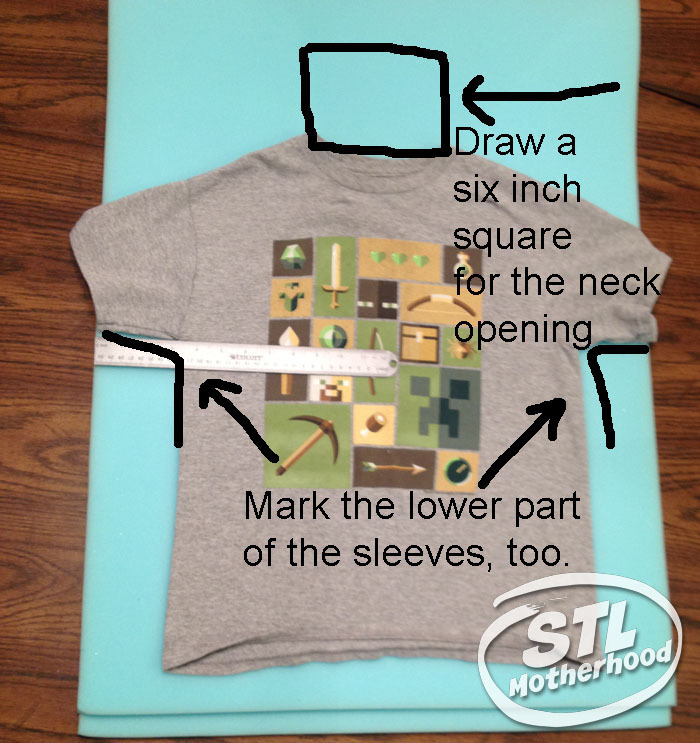 I found the height by measuring the sleeve while flattened out, then subtract 9 (the width). Divide that number by 2 and you have the height of your sleeve. The panel we used was 3 inches tall, by 9 inches wide. Use the low temp hot glue gun to glue the pieces together. Glue just one seam at a time. Once the glue has time to set–just a few minutes with hot glue–add the blue outline to the outside edges. This makes the armor look more Minecraft like and camouflages any rough cuts in the foam. Decorate with squares of white felt to add the “sparkles.” We used a Minecraft action figure for inspiration, but Mitch just stuck the felt on where he thought it looked best. 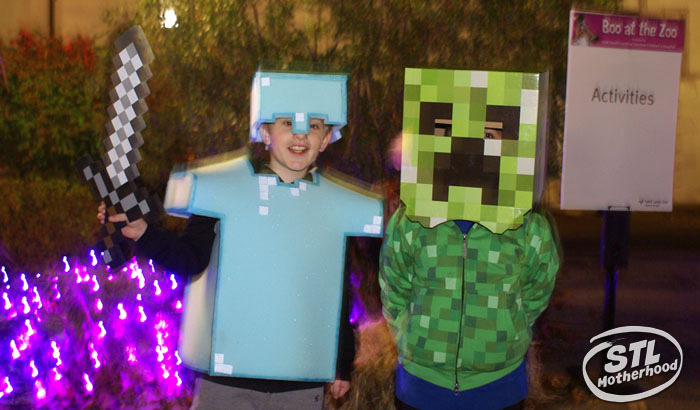 By the way, don’t miss my most popular post, the DIY Creeper costume!